We know our readers love hyperrealistic painting -- those almost realer-than-real depictions of everyday life, captured in granular details that exceed the powers of normal vision. In our humble opinion, the technical art form is at its most divine when accented with conventional materials loaded with textures more anomalous than you'd ever expect. Exhibit A: honey. The ingredient best known for complimenting a cup of hot tea is a sensual marvel to behold, its viscous, golden, glittering form oozing and undulating at a sluggish yet elegant pace. No one knows this better than painter Mike Dargas -- well, and perhaps photographer Blake Little, to be fair. 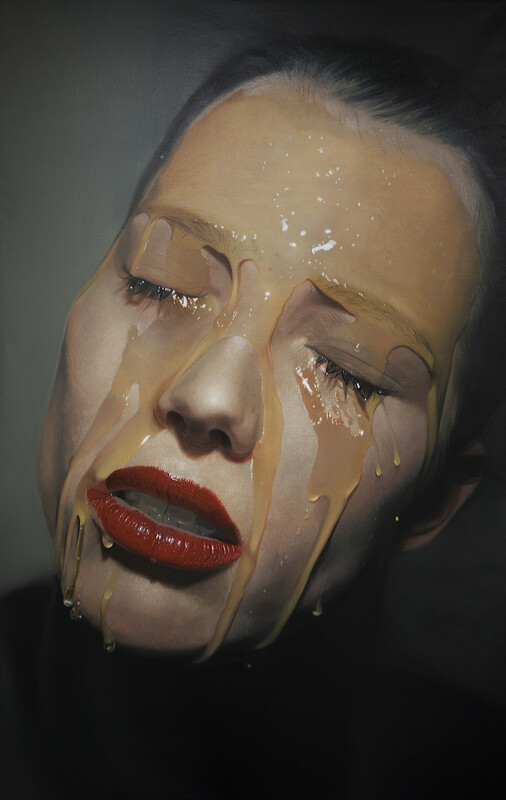 The Cologne-based painter started working on the honey-centric series in 2014, after toying with a variety of different liquids. The unusual consistency of honey caught Dargas' eye. "It's transparency and reflections are perfect for my realistic works," he explained to The Huffington Post. And thus a hyperrealistic series was born. Dargas painstakingly depicts women's faces drenched in honey, capturing every pore, every gleaming honey drop, every misplaced eyebrow hair and even the occasional taste bud. If you've never been up close and personal with a honey-soaked human being before -- no judgment, we haven't either -- this is probably as close as you'll ever get. "It's a very personal process and I want the viewers to see this emotion," Dargas explained. Consider it seen. Catch a glimpse of Dargas' incredible works, and some behind-the-scenes shots, below.